Seahawks free agency Day 2: Sweezy gets away while team tries to keep Fluker; Hundley heads to Arizona; and Clark’s price going up? So much for the Seahawks keeping their offensive line together heading into the 2019 season, a goal coach Pete Carroll began stating as early as last October. Instead, the Seahawks watched on Tuesday as free agent guard J.R. Sweezy agreed to a reported two-year contract with the Arizona Cardinals. The news was first reported by Ian Rapoport of the NFL Network. Financial details were not immediately reported. Sweezy was one of two departures on the day, both to Arizona, as backup QB Brett Hundley agreed to a one-year deal with the Cardinals. Each came on the second day of the NFL’s “legal tampering” period when teams can negotiate with pending free agents. Teams can begin officially signing players on Wednesday. As of Tuesday night, Seattle had seen five free agents commit to signing elsewhere while yet to add anyone. Sweezy started 15 games for the Seahawks last season, 13 at left guard, helping the Seahawks forge a rushing attack that led the NFL with 2,560 yards in 2018 and re-established a tone for physicality that Carroll said was vital in getting the team back into the playoffs. Sweezy and usual starting right guard D.J. Fluker are each free agents and the Seahawks had been hoping to keep both and keep the line intact. Sweezy is now gone but the team remains hard at work on trying to keep Fluker. One league source said Tuesday afternoon that Fluker and the Seahawks were “still talking” in an attempt to get a deal done. The other three starters from 2018 are set to return — center Justin Britt, left tackle Duane Brown and right tackle Germain Ifedi. Carroll said during the team’s trip to London last season, as it became apparent the line was vastly improved from the previous few years, that he hoped it could stay together. Carroll repeated similar sentiments whenever asked, including last month at the NFL Combine. But at the Combine he also foreshadowed that the Seahawks would let Sweezy and Fluker test the market and see what happens. And while the Seahawks wanted to keep the line together, they also have a number of challenging financial decisions upcoming, such as a longterm deal for defensive end Frank Clark, and did not match Arizona’s offer. Sweezy, 29, had said he wanted to stay, once even saying he would be happy to end his career in Seattle. He was originally drafted by the Seahawks in the seventh round in 2012. But money and security usually win out in the NFL and did here. This is now the second time Sweezy has left the Seahawks via free agency. After emerging as a starter in 2013 and starting 46 games in the 2013, 2014 and 2015 seasons, including both Super Bowls, Sweezy signed a five-year contract worth up to $32.5 million with Tampa Bay following the 2015 season. But Sweezy missed all of the 2016 season with a back injury and then played 14 games in 2017 before suffering a broken leg. That led to him restructuring his contract and then being released last June. He had been due to make $6.5 million last season with Tampa Bay before being cut. He visited the Seahawks a few days later and then about a month later signed a one-year contract with Seattle worth $1.5 million. Seattle may be anticipating that third-year guard Jordan Simmons can fill in for Sweezy. Simmons started three games last season, and in his starts against the Rams and Vikings the Seahawks had their two highest-rushing games of the season with 273 and 214 yards, respectively. Simmons suffered a knee injury against the 49ers on Dec. 16 but is expected to be ready for the season. The Seahawks have given him a qualifying offer as an exclusive rights free agent, something the team is expected to officially announce on Wednesday. Seattle has 10 offensive linemen under contract for the 2019 season as of Tuesday — Simmons, as well as guards Ethan Pocic and Jordan Roos, centers Britt, Marcus Henry and Joey Hunt (also an ERFA who has been given a qualifying offer) and tackles Brown, Ifedi, Jamarco Jones and Elijah Nkansah. Pocic could also emerge as a contender to start at one of the guard spots, though Simmons had moved ahead of him before being injured. Pocic, a second-round pick in 2017 out of LSU, began the season as the starter at left guard with Sweezy at right guard before being injured and then Fluker returning. It was when Fluker entered the lineup at right guard and Sweezy moved to left guard in the third game of the season that the Seahawks’ offense began to clock. The Seahawks are also expected to give a tender to restricted free agent George Fant, giving them an 11th offensive linemen under contract. And one additional thought about what the team could do now with Sweezy gone is using Fant as a starter at right tackle and moving Ifedi to guard, where he started as a rookie in 2016 and played one game last season. 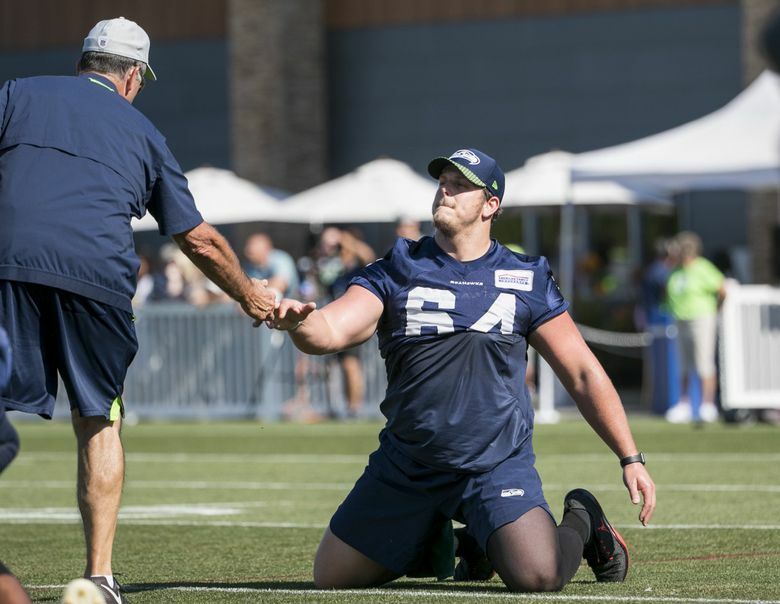 As for Sweezy, his second stint as a Seahawk ends having left a lasting imprint for toughness. He played in the playoff game against Dallas after having suffering a chipped bone in his foot two weeks previously. Hundley, who was Seattle’s backup quarterback in 2018, is also heading to Arizona to sign a one-year contract with the Cardinals, according to Adam Schefter of ESPN. The NFL Network reported that the deal is for $2 million with a maximum value of $3 million. Hundley was acquired in a trade with Green Bay for a sixth-round pick prior to the 2018 season but did not play a down last season as Russell Wilson took every snap, the only NFL starting quarterback to do so. Seattle traded for Hundley after deciding that 2018 seventh-round pick Alex McGough wasn’t yet ready to be the backup and with veteran Austin Davis as the only other option on the roster. Seattle intended to groom McGough for a year or two on the practice squad. But McGough signed in January with Jacksonville, which was said to have courted him aggressively. Seattle in January signed Paxton Lynch knowing that Hundley might not return. Hundley grew up in Chandler, Ariz., and the Cardinals also have a more uncertain quarterback situation, giving Hundley a better chance of playing than he would have with the Seahawks. Since the Seahawks have yet to agree to any deals with unrestricted free agents they would at the moment qualify for four compensatory draft picks in 2020, according to Nick Korte of OvertheCap.com. On Monday, cornerback Justin Coleman, defensive tackle Shamar Stephen and running back Mike Davis agreed to deals with Detroit, the Vikings and Bears, respectively. DOES TREY FLOWERS’ DEAL UP THE ANTE FOR FRANK CLARK? COULD DEE FORD’S? Seattle’s attempts to get Clark signed to a longterm deal might have gotten a little more complicated Tuesday with the news of the contract that the Lions are giving free agent defensive end Trey Flowers. Flowers, lured away from the Pats, is expected to get a five-year deal worth up to $90 million, with $56 million guaranteed. Clark was slapped with a franchise tag last year that would give him $17.128 million for the 2019 season. But each side would prefer a longterm contract to secure Clark’s future. With Flowers getting $18 million a year, Clark is likely to want at least that, if not more, with some speculation he might want as much as $20 million per season. While sack stats may not tell the whole picture of a rush end’s effectiveness, Clark has Flowers beat by quite a bit. Each was taken in the 2015 draft and while Flowers had 21 sacks in his four years with the Patriots, Clark has 35, including a career-high 13 last season. Clark is one of four ends who received the franchise tag, the others being Demarcus Lawrence of Dallas, Jadeveon Clowney of Houston and Dee Ford of the 49ers. One thought has been that all are waiting it out until at least one of the others signs, potentially re-setting the market. That may be about to happen after a report Tuesday night that the Chiefs are discussing trading Ford to the 49ers, who would reportedly then get a five-year deal worth up to $87.5 million. That would further help establish a baseline for a Seattle contract with Clark (though it’s worth noting Ford was categorized as a linebacker for tag purposes and was due to get $15.4 million this year on the tag, so he’d be getting more than a $2 million raise. The NFL Network was among those reporting the 49ers would send a 2020 second-round pick to the Chiefs for Ford. It’s known teams have also called the Seahawks about Clark. The second-rounder KC is getting for Ford could also set a baseline of any possible trade for Clark if Seattle thinks it won’t be able to get a deal done.